The Ponca City Public School Chamber Strings, under the direction of Jaryd Hinch, and Symphony Strings, under the direction of Paula Cochran, received Excellent and Superior ratings, respectively, at the Oklahoma Secondary School Activities Association String Contest this week. 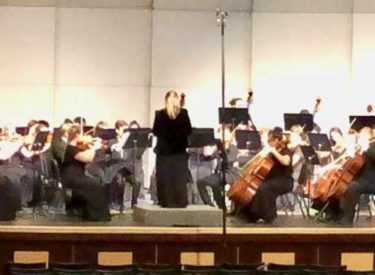 The two high school orchestras traveled to Edmond Santa Fe High School where they competed with the premier high school orchestras in Oklahoma. The Chamber Strings performed Tango d’Amour by Susan Day and North Star to Freedom by Soon Hee Newbold, and the Symphony Strings performed Legend of the Phantom Pirate by Brian Balmages and Andante Festivo by Jean Sibelius. OSSAA String Contest has been in place for 17 years, and the Ponca City orchestra has competed in 16 of these contests. The Symphony Strings looks forward to continuing their 15-year legacy of earning Superior ratings, once again qualifying for OSSAA Sweepstakes. The student musicians will usher in the most wonderful time of the year at the Holiday Concert, at 7 p.m. Dec. 10 at West Middle School auditorium. The orchestra will perform classics, such as Leroy Anderson’s A Christmas Festival and Sleigh Ride, as well as contemporary selections composed by Trans-Siberian Orchestra. Cochran invites former Maestro Dan Larson, Jaryd Hinch, Katie Rolf, and Andrew Orr to conduct the Symphony Orchestra to celebrate the holiday season.